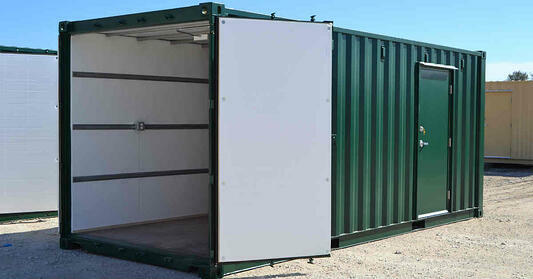 Expand your storage options beyond the garage; shipping containers offer secure storage for your high-value equipment. Plug and play lighting, shelving and electrical outlets turn containers into a stand-alone space for maintenance equipment and hobbies. Unlike the time-consuming stick-built structures, containers arrive on your land ready for use. Shelving and work benches for tidy storage. Climate and humidity controls protect paperwork from mold and equipment from rust, and steel walls keep your high-value items secure against rodents and theft. Garage for a spare car, ATV, or motorcycle. When you need space to store equipment and to make quick repairs, a shipping container with shelving, lighting, and a workbench makes an excellent workshop. Reclaim your guest house or garage by moving the tools for your hobby into a shipping container workshop. Steel walls and carefully selected personnel doors also create a secure space for hunting and fishing equipment. 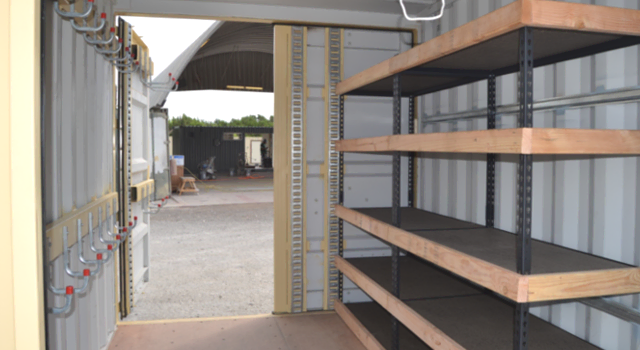 Planning to use a shipping container for storage? Call us at 877-704-0177 or send an email to sales@falconstructures.com.